Reprint of LEC #221, 21st Series, V. 1 in 1952. 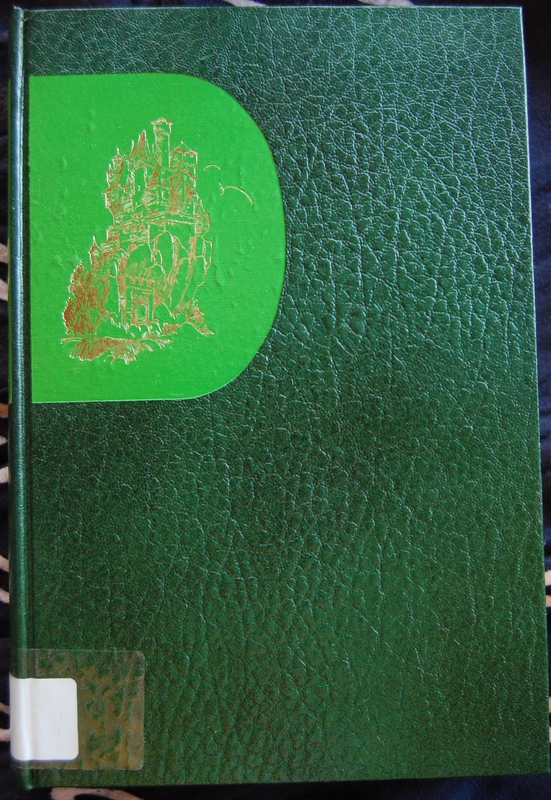 Front Binding – New York is on top, Connecticut bottom. The Singular Adventures of Baron Munchausen, printed twice by the George Macy Company, is a collection of crazy tales of a fictional Baron Munchausen, who came up with some whoppers to tell his distinguished colleagues. Of course, the Baron insists that they were all true. ;) The first printing of the tales was the third book the Limited Editions Club published in 1929, with engravings by John Held Jr. and an introduction by Carl Van Doren. That edition was never reprinted as a Heritage. 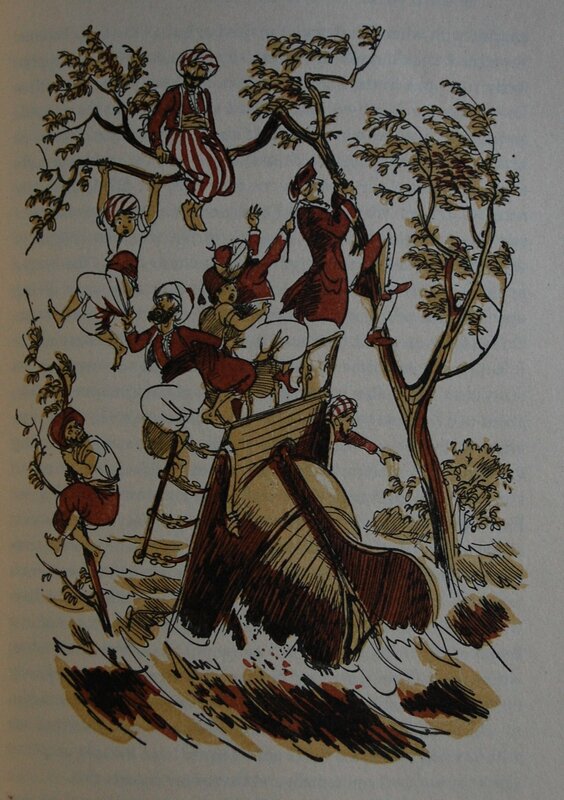 However, in 1952 the Baron’s whimsical stories were revisited by the LEC, and that particular rendition did get a Heritage edition, the one you now see before you. Fritz Kredel, who is no stranger to this blog, with The Warden, Andersen’s Fairy Tales, The Life of Benvenuto Cellini, Barchester Towers, The Book of Ballads and Four Plays of Marlowe featuring his talents in some fashion. A fairly diverse list of authors, huh? Kredel passed away in 1973, but he left his impression on the LEC, no question. The New York edition of the Heritage reprint was designed by both Kredel and George Salter. 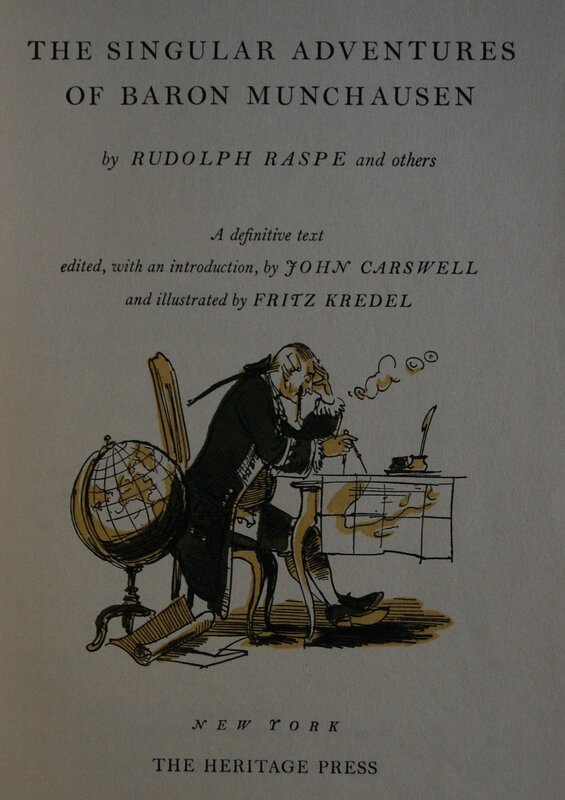 Salter handled the text, Kredel the illustrations. 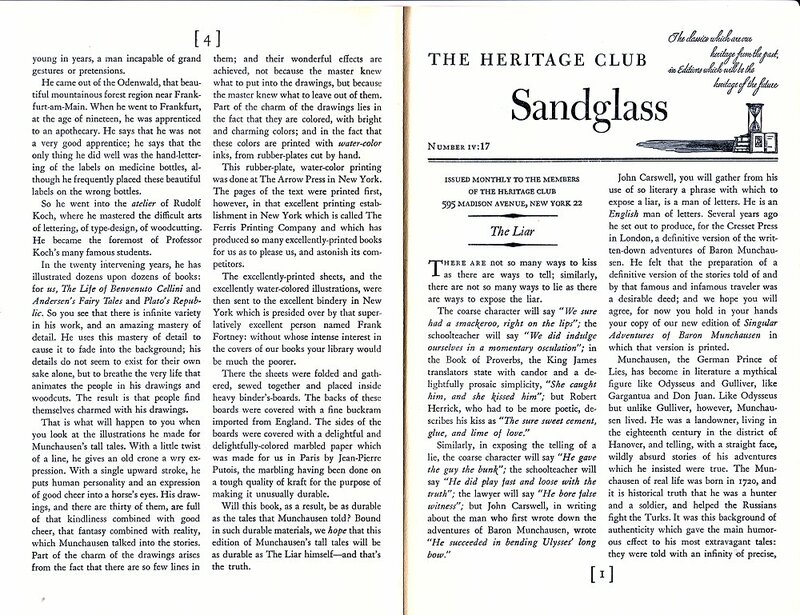 Salter went with Bell Monotype for the font, and there’s a slew of information on it in the Sandglass below. Kredel’s work in here is drawings colored with water-color inks, created by using hand-cut rubber plates. The Arrow Press was responsible for the illustrations, while The Ferris Printing Company printed up the text. Frank Fortney of Russell-Rutter fame was the binder. 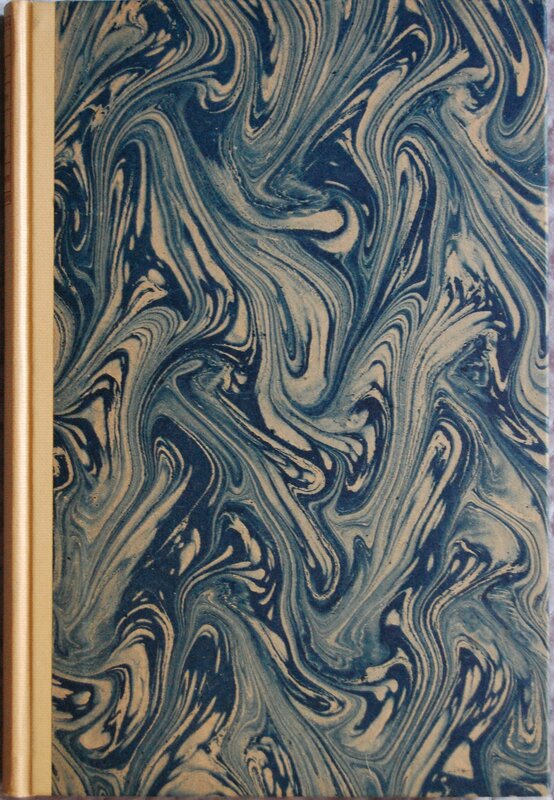 The marbled paper covering the boards were specially made by Jean-Pierre Putois of Paris, with the boards themselves made of English buckram. I know nothing of the Connecticut printing. Macy was never quite pleased, it seems, with the first LEC Munchausen–principally because he believed the illustrator, John Held, Jr., did not take his job seriously. Actually, it was a bold choice to use Held, who was famous for his comical portraits of flappers and 20s jazz babies and his New Yorker magazine covers to illustrate this piece of Germanic frivolity, and Macy probably thought the chance to do something of more than ephemeral interest would spur Held to create something extraordinary. That he did not is probably true, but what is also true is that viewed today, the illustrations have a good deal of charm and pungency, and their unusual color scheme I find most interesting. 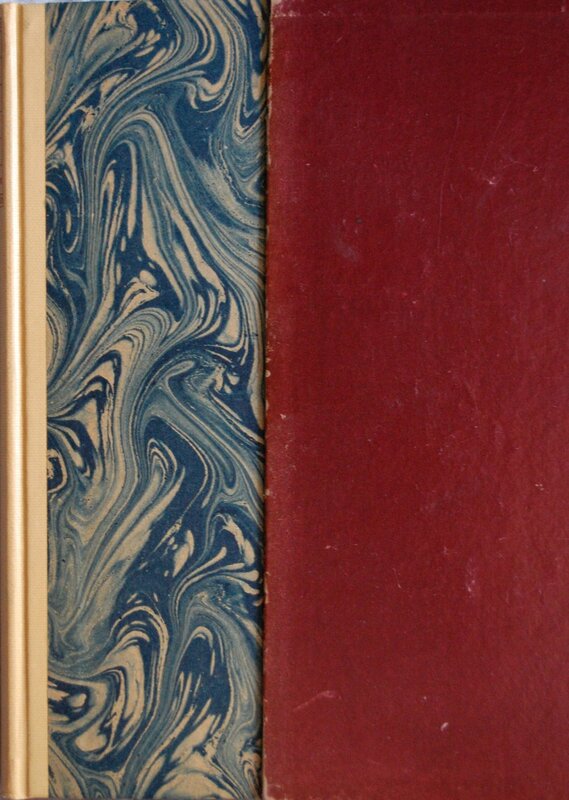 Although some have not found the binding to their taste, it is one of my dozen or so favorites of all the LEC bindings–just love those big fish and the marbled paper sides. 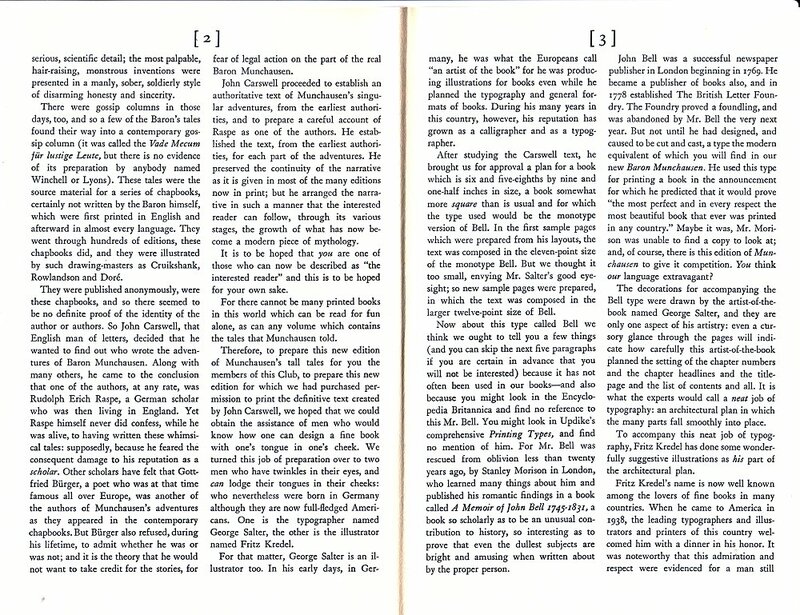 Title Page – This is declared the “definitive” edition of Munchausen, a claim the earlier LEC did not make. John Carswell poured through the lore of the good Baron, and compiled everything original author Rudolph Raspe and a few copycats composed into this edition, making this the first time all of Munchausen’s tales were fully assembled in one place. He also wrote the Introduction for the work. You can learn much about Carswell in the Sandglass. Page 4 – I imagine the LEC features full-color illustrations, but Kredel’s charm still radiates from these illustrations. A good fit. Personal Notes – I got this at Monterey’s BookBuyers, another part of the trade-in deal I got from them. It’s in very good shape, although that lovely marbled paper is not completely attached to the boards any more. I’ve read all of Raspe’s work in here, and it’s whimsical and entertaining. However, I found the first of the imitators to be lacking, so I’veput it aside. Too many other things to read! 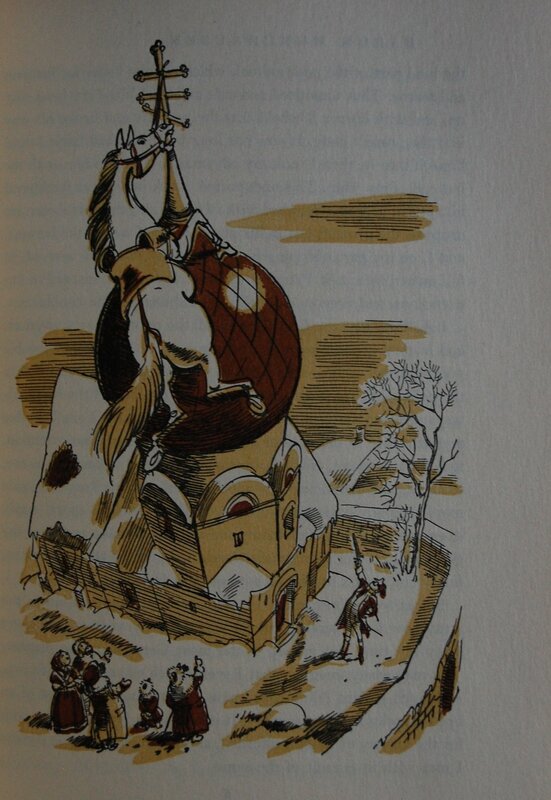 You are currently reading Heritage Press – The Singular Adventures of Baron Munchausen by Rudolph Raspe and others (1952) at The George Macy Imagery.